Premium 100% Natural Beef Jerky Treats Your Dog Can’t Resist! Premium all-natural dog beef jerky treats made with only 100% USA natural beef muscle. Slow-roasted for 33 hours to lock in flavor and nutrients — a guilt-free, healthy treat your dog will love! Does your pup crave tasty treats? Do you worry that many store-bought pet treats may have possibly harmful additives, flavorings, chemicals, and preservatives? Do you wish you could get premium-quality dog treats with absolutely no artificial ingredients? You're not alone! EcoTreats™ Beef Jerky Strips are made from whole muscle 100% natural USA beef and are packed with flavor (nothing else!) that dogs absolutely love. Pet parents love knowing that their pup is getting a high-quality, protein-rich snack with no harmful additives or ingredients -- only beef! EcoTreats Beef Jerky Strips are suitable for all life stages, from puppies to senior dogs. Treats should be a part of every dog’s life and you can be happy knowing you are giving your dog a healthy treat they can’t resist! Try EcoTreats Beef Jerky Strips -- a Guilt-Free, Healthy Treat with SUPERIOR Taste! Because of the palatability and wholesomeness of these slow-roasted treats, they are an excellent choice for finicky dogs or dogs with food sensitivities – as well as for use as a reward. Your pet will go crazy over these 100% natural treats and you'll love knowing there is only one ingredient: beef! Beef is the only ingredient, so these treats are naturally grain and gluten free. Plus, beef is packed with essential nutrients including Vitamin A, several B Vitamins, Iron, and Protein. Pups and pet parents agree — EcoTreats Beef Jerky Strips are a delicious and healthy treat. Treats should make up less than 10% of your dog’s daily diet. These treats can be served as a healthy addition to your dog’s normal balanced diet. For safety (and, well, bonding of course! ), supervise your dog to make sure no chewing problems exist. Always keep fresh water available for your pet! Show Your Pup Some Affection! 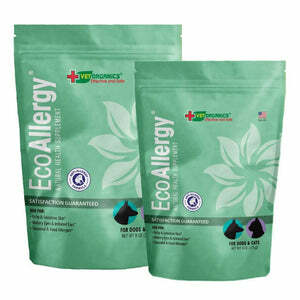 As with all Vet Organics products, EcoTreats are fully-backed by our unconditional satisfaction 100% money-back guarantee. SERVING SUGGESTIONS: Feed as a healthy treat. Treats may be served whole or broken into pieces as needed for smaller dogs. Feed only 1-2 pieces per day at first to ensure no food allergies or chewing/swallowing problems exist. Feed one (3-4") treat per 5 pounds of body weight daily. WARNINGS: Not for human consumption. Do not use on carpets. For optimal life of the product, please store air-tight, in a cool, dry place. If there are any bits and pieces left over at the end of the bag – use them as a food topper for a little extra surprise at dinner time!